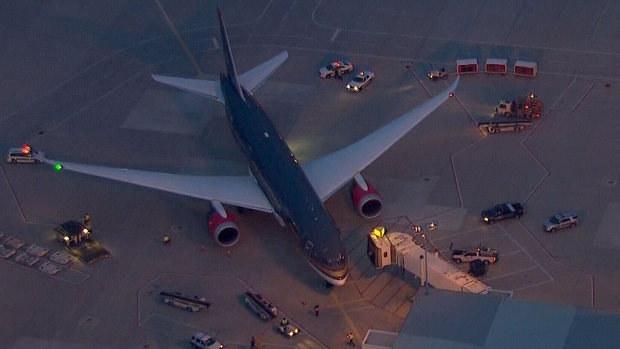 TORONTO -- The latest government-organized flight carrying Syrian refugees to Canada has landed in Toronto, with Gov. Gen. David Johnston on hand to greet the newcomers. The chartered plane from Beirut, carrying about 214 refugees, is the fourth flight organized by Ottawa as part of its plan to bring 10,000 Syrian refugees to the country by the end of the year. Johnston, his wife, his daughter and four grandchildren were going to greet the first few refugees later Friday once they were processed by immigration officials. He spoke with some of the federal government employees who were going to issue Social Insurance cards to the refugees. He thanked them for their work and also shook hands with an interpreter on hand to help the refugees. He tried out a few words of Arabic, including the term for the word "welcome." The latest flight means nearly 1,500 Syrian refugees have arrived in Canada since the Liberal government took office. The Liberals have promised to bring a total of 25,000 refugees to the country by the end of February.